On October 27 at 8:04pm, a 7.7 magnitude earthquake struck just off of Haida Gwaii, in northern British Columbia. The quake triggered a wave of tsunami warnings along the West Coast of North America and as far reaching as Hawaii. While Hurricane Sandy made global headlines in the east, the news of the quake was widespread across social networks. Why was the earthquake story getting so much attention? Because of a lack of social media preparedness. While real-time tools were available, a Canadian warning was not issued until 39 minutes after the US’. 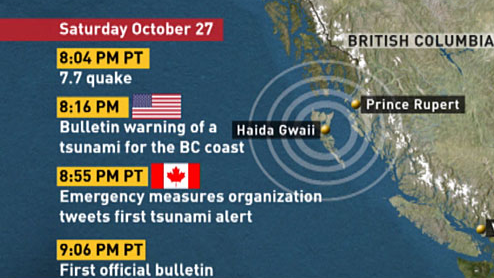 At 8:07pm on October 27 2012, American authorities delivered the first tsunami alert, just three minutes after the earthquake hit the northwest coast of B.C. The first warning released from Emergency Info BC’s Twitter account came 39 minutes later – long after other news channels and U.S. bulletins issued warnings. Questions have been raised as to why BC emergency didn’t respond right when the earthquake hit and tsunamis threatened. CBC Television investigated the matter further in an interview with Kelli Kryzanowski of BC’s Emergency Management team. Kryzanowski stated that the agency activated nine operations centres, sending out thousands of phone calls, emails and faxes to first responders minutes after the quake. 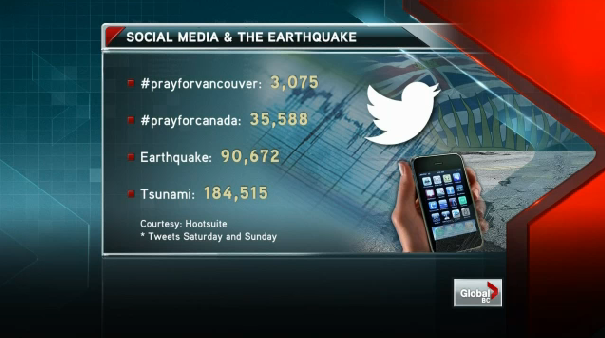 Had some of those initial 1,600 faxes been tweets, would @EmergencyInfoBC still be under such public scrutiny? Citizen journalists, news outlets and authorities share the news. News gets picked up, amplified and spread around the Twittersphere. General outpouring of concern: Caring for loved ones and spreading hope for the affected areas. As seen in other natural disasters such as Hurricane Sandy, social media has proved a fundamental tool for connecting people and supplying information. And, while a sudden earthquake doesn’t leave ample time for emergency personnel to prepare, it should jumpstart preparations for future emergencies. In a recent interview with Alex Schott, Entergy’s Social Media & Digital Communications Strategy Manager, we explored his top 4 social media crisis management tips for businesses on the frontlines of disasters. His interview with HootSuite was in response to his quick and effective communication with the thousands of customers without Entergy’s power during Hurricane Isaac. What’s our main social media takeaway tip for today? Preparation for a disaster must include a means of real-time communication. While it is essential to be physically prepared for emergencies, it is crucial to strategize around how to maintain open lines of communication and provide current information to those in need during a natural disaster. No one wants to be left in the dark. HootSuite helps corporations conduct crisis simulations. Test your company’s ability to react using social media during a disaster. If you’d like to know more, contact the HootSuite Enterprise team using this form.